We gave you the forecast from the northeast earlier. So what does it look like in the northwest? There are 70 active fires in that area, down from the 77 there were yesterday. 63 of these fires are either under observation, being held or are under control. That means 7 are out of control. There were two new fires identified Wednesday: one in Dryden and the other in the Nipigon district. The fire in Dryden was small, 0.1 hectares and was extinguished as of Wednesday afternoon. 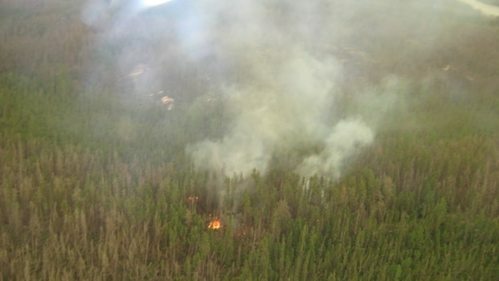 The Nipigon fire is about 0.2 hectares in size. There are still 55 active fires in the northeast, the same amount as yesterday. But the number of fires out of control has dropped, largely thanks to the wet weather. 38 of the fires are being held, under control or being observed. 17 are still out of control, including Parry Sound 33. 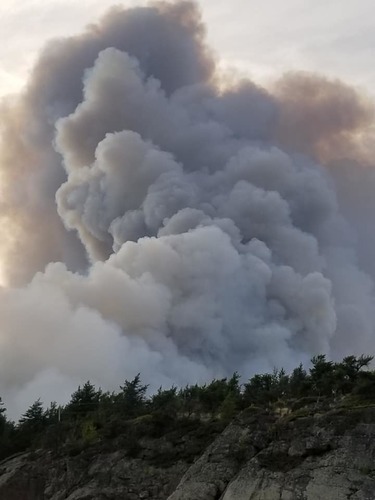 Ministry of Natural Resources and Forestry spokesperson Shayne McCool says the rain allowed crews to "make good headway" on all these fires, but that it will "take some time" to get them contained. There are five new fires that have sprung up since we last spoke. Three are in the northwest. One is on Savant Lake, in the Sioux Lookout district. It is small, 0.5 hectares in size and is caused by lightning. It is being held. Another is on Red Lake, 0.1 hectares big and also caused by lightning. It is under control. The final in the northwest is on Feist Lake along the road between Dryden and Kenora. It is 0.1 hectares in size and is being held. The difference is this one was caused by humans. The other two fires are in the northeast. One has popped up south of Longlac and the Ginoogaming First Nation. It is small, 0.2 hectares in size, but is not under control. The cause was lightning. The final is just outside of Kirkland Lake. It is 0.1 hectares in size and caused by lightning. The good news is it is under control. 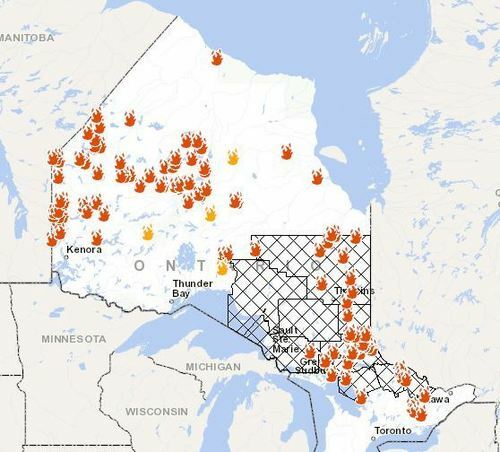 We are continuing to track the forest fires in northern Ontario. The weather has helped the situation but many fires still remain out of control. Here's a look at the active fires in the north right now. The red flames represent active fires. The yellow flames represent new ones. You can see the ministry's fire map for yourself here. 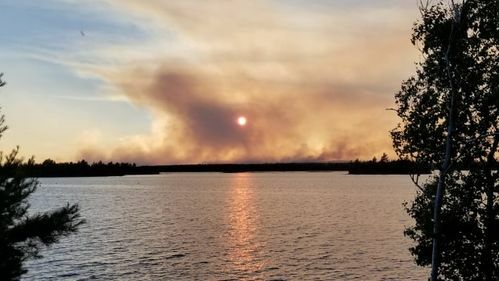 While residents of Wabaseemoong First Nation make their way home as the air quality caused by a fire near Kenora continues to improve, three new fires have sparked in the northwest region as of Tuesday evening. These photos are a few days old but give an incredible glimpse into the rescue and firefighting efforts. This is Parry Sound 33, the fire that started at Henvey Inlet (in between Parry Sound and Sudbury). It has grown to 5,612 hectares and is currently out of control. The photos were provided by JJ Whitmell. You can see many more here. Jeff Landriault owns Ellen Island Camp on Lady Evelyn Lake. He's been doing rain dances ... and it looks like they have worked. He got special permission from the province to stay behind and protect his property but it has been "pretty scary at times." "We've had nights where we've taken shifts staying up all night in case the wind shifted and it started marching toward us." He was relieved this week to see a "normal sunset" again after some significant rainfall. 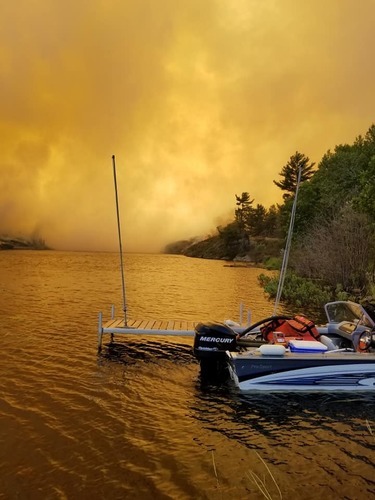 Rain showers in the last few days have brought great relief to the people fighting — and the people fearing — the dozens of forest fires burning across northeastern Ontario. What's happening in our forests? That's the question Ontario Today asked as part of their call-in this afternoon. We heard from folks around the north about how the fires were impacting them and what they thought the longer impact would be. We streamed the conversation on Facebook. You can rewatch it here. Amanda Pfeffer was in filling in for host Rita Celli. Gary Rota, an emergency physician in the northeast wrote in and called the show to talk about the health impacts he is seeing from the fire. Here's his thoughts. "I am seeing episodes of asthma, chest pain and COPD likely linked to these fires. Also seeing mental health issues related to high temperatures. The small particulates released in forest fires have both short and long-term health effects and fire frequency, duration and size are expected to increase significantly in the coming years as climate change continues to occur - here in the north much faster than elsewhere." 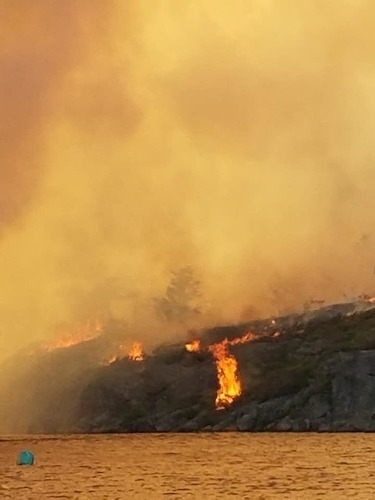 Yesterday, we told you how construction workers on a wind farm project are alleging that the Parry Sound 33 fire was sparked by the project's construction. Reaction has been coming in on that story, including from this cottage group association who is demanding action "be taken to avoid any further destruction." Where are the firefighters coming from? Perhaps you've heard about the firefighters who have come to the north from Mexico to lend a hand. But there are several provinces and states helping out too, with crews, equipment and aircraft. The ministry is also expecting more crews and equipment to arrive this week, including Parks Canada's ignition specialists. In some cases, in tents, though the conditions are a little smoky. 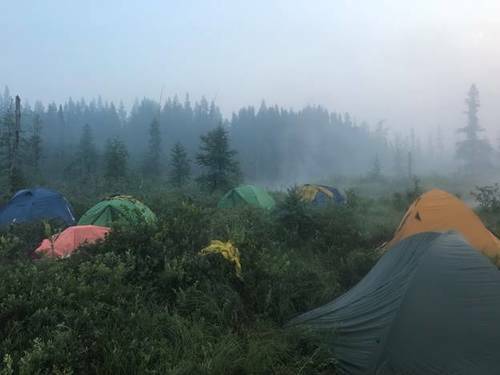 Here's a bunch of tents near the North Bay 72 fire, courtesy of the ministry of natural resources and forestry. 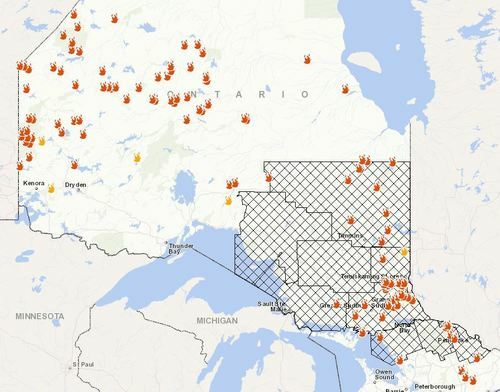 According to the fire information officer with the Ministry of Natural Resources and Forestry, two new fires have been identified on Wednesday as the fire hazard in the southern portion of northwestern Ontario reaches high to extreme. 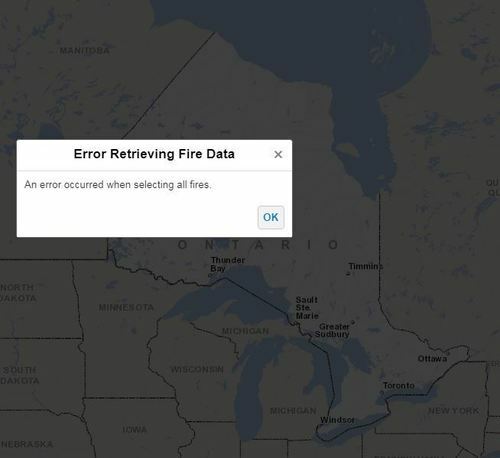 The ministry of natural resources and forestry's handy forest fire map is down at the moment. A ministry rep said traffic to it has been very high and they are getting someone to look into the difficulties. The tool has been invaluable in tracking each individual fire. We'll give you an update when it goes back up. What happens if the fire comes here? French River hasn't been hit by Parry Sound 33 just yet but they are prepping for it. The municipality is a few kilometers away from the fire at the moment, leaving some residents anxious. Alex Strachan, who owns and operates the Lodge at Pine Cove, thinks the ministry and municipality should consider mobilizing volunteers, along with ministry workers, to cut down swaths of trees on either side of Highway 69. "I bet you if the call went out here you'd have 500 people from this municipality there in a few hours, and you'd probably have hundreds of others coming up from Parry Sound, Sturgeon Falls, Sudbury, et cetera." 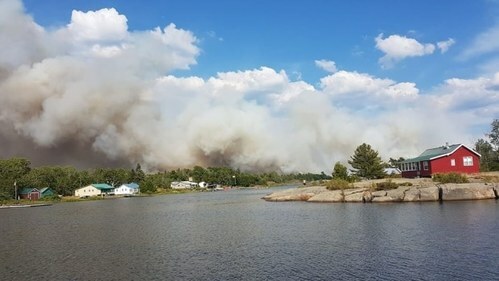 The forest fire known as Parry Sound 33 is still about 15 kilometres away from the Municipality of French River, but some residents and business owners are saying it’s better to act now. 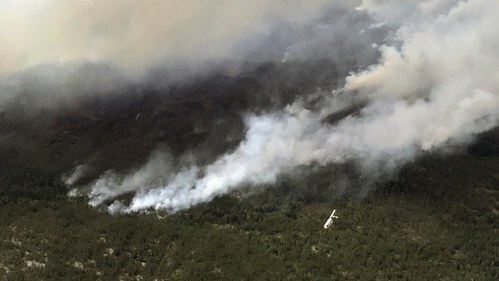 As of early Wednesday afternoon, fire information officer Shayne McCool said there's been no growth in the 5,600-hectare blaze, and rain was helping temper the flames and smoke. I can see it again! Must have been a momentary hiccup with the level of traffic on the map. Keep in mind: red flames are active fires, yellow flames are new fires and that barbed wire looking design is the restricted fire zones, where no fires are allowed. The fire, dubbed Cochrane 4, has been burning since June 14. It is not far from Hudson Bay, near Polar Bear Provincial Park. It's large, 3264 hectares in size, and was started by lightning. The ministry has it listed as being observed. It's also really, really remote. Several listeners during Ontario Today brought up the need for the provincial or federal government to do something about the fires. In fact, the fires did come up at Queen's Park yesterday. I've scoured through the hansard for you. 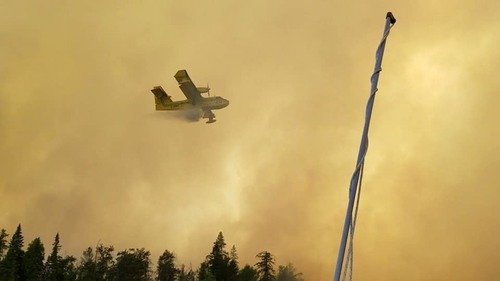 Jeff Yurek, the minister of natural resources and forestry, said they are doing "all we can to fight these fires, attacking both from the air and on the ground." He mentioned the 450 people brought in from different parts of North America to help fight and thanks both them and the Ontario rangers. I included some video from the ministry earlier in the blog ... it's been hard to get fresh video from on the ground given how remote some of the areas where the fire are. It was shot yesterday so here's some good context to keep in mind.